If you’re building from scratch, choose a design that is easy to insulate, such as one with an actual ceiling and roof rather than floor-to-ceiling glass panels. Have a contractor determine what level of and type insulation can be used with your design, and what is most appropriate for your climate. Insulate both the space above the ceiling and the space below the floor, as well as in between glass panes if the design allows. Seal up leaks in the frames. Use a clear caulk or add weatherstripping around the frames to prevent air from leaking. Tint the windows. Tinting reduces the intensity of sunlight, minimizes glare, and helps block the sun’s ultraviolet rays, which can fade furniture. A variety of tints are available that will prevent excessive sunlight from coming into the room. Choose a “low-E” radiant blocker, which will prevent radiant solar energy from entering the room in the summer, and will also keep radiant energy from escaping in the winter. Cover the windows. During the cold months you can use an inexpensive weatherization kit to add a layer or two of plastic film over the windows, which are easy to remove and apply. You can also add insulation with drapes or other window shades. During cold months, keep them open during the day to enjoy sunlight, but close them in the evening to keep out cold air and still enjoy the space. You can also hang reflective shades to prevent excessive sunlight from entering your room in the summer. Add a ceiling fan. A bit of circulating hair can make a significant difference in a room. A ceiling fan will offer a breeze and keep your sunroom from feeling stuffy. Because motorized shades can be used with sunlight sensors or set on a timer, they’re great for keeping sunrooms cool, even while you’re not around to close them. Automatic shades won’t ruin the look of your sunroom either, as they’re custom made to fit your sunroom windows perfectly, with matching casings, and even be installed exteriorly. White opaque shades will help reduce temperatures by deflecting the sun, and you can even use material that will block UV rays. Not only does it make it safer to lounge in on hot days, but it can also save your upholstery from sun fading. 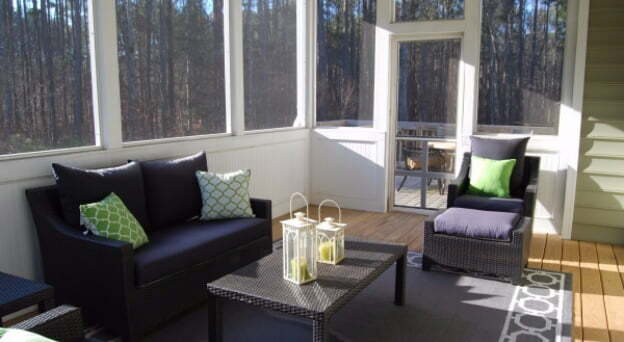 If you’re building a sunroom, then you can use nature to influence how hot or cool it gets. For best wintertime sun exposure, building the sunroom so that the glass windows are facing true south is best. For Toronto homes that experience cold winters, use a double (or thicker) glass to provide better insulation. Avoid dark colours that will soak up the sun’s heat, such as dark walls and tile, or dark stone floors. Make sure you insulate the roof and the exterior walls well, and provide plenty of ventilation. Windows and skylights that can be opened, doors that can provide a cross-draft and even ceiling vents will help keep your sunroom cooler during the hot summer months. Don’t let the heat chase you out of your sunroom -use these tips and you can get more use out of your sunroom year-round. We create custom sunroom shading solutions in the Toronto area – contact us if you have any questions on how motorized shades can add comfort to your sunroom.